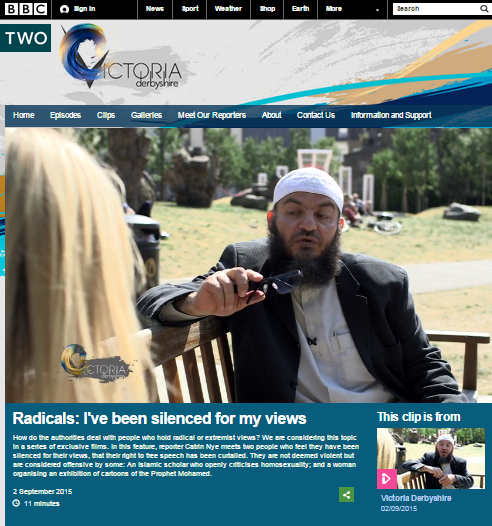 At the beginning of this month the BBC Two programme ‘Victoria Derbyshire’ – billed as “the BBC’s new daily news and current affairs programme” – presented a series of reports by Catrin Nye on the subject of ‘radicals’. Those filmed reports were also promoted separately on the BBC News website, along with a written article by Nye titled “What should we do about radicals?” in which the filmed reports are again embedded. Interestingly, Catrin Nye’s definition of radicals holding “views that many consider offensive” appears to be limited to the far right and Islamist extremists, with no representation whatsoever from the far left of the political spectrum in any of her reports. “Islamic scholar Sheikh Haitham al-Haddad openly criticises homosexuality. He has been called a bigot, a hate preacher and has had talks at a number of UK universities postponed or cancelled. In the film itself Nye also tells viewers that al Haddad believes that “leaving Islam is punishable by death in the right circumstances” and that “Sunni Muslims shouldn’t marry Shias” but fails to mention that, among other things, Haitham al Haddad is also a proponent of female genital mutilation, sees nothing wrong with violence against women and promotes antisemitism and conspiracy theories. Nye’s challenges to al Haddad (and her other interviewees) are on the whole very tame. The result is that he and other extremists get a largely unhindered platform from which to present themselves as ‘misunderstood’ and even victims. The bottom line messaging in this series of reports is that extremist ideas should be weakened through public debate. One can of course debate the merits of that approach in general, including the question of whether there is in fact a debate to be had with people who reject basic democratic principles such as equal rights for women, members of the LGBT community and people of all colour and race. And one can also ponder the question of whether the BBC, committed as it is by its public purpose remit to “sustaining citizenship and civil society” and with editorial guidelines on impartiality which state that achieving due impartiality does not require “detachment from fundamental democratic principles”, should be obliged to present more robust challenge to views such as those promoted by Haitham al Haddad if it elects to broadcast them on a publicly funded platform.